Linking up today with Jenna. Our family is kind of crazy, and tend to be on the road more than your average family. This wasn't always the case, but living farther from our families means that we find ourselves in the car a lot. I would not call ourselves pros, by any stretch of the imagination, but I have figured out a few tips for surviving the drive! 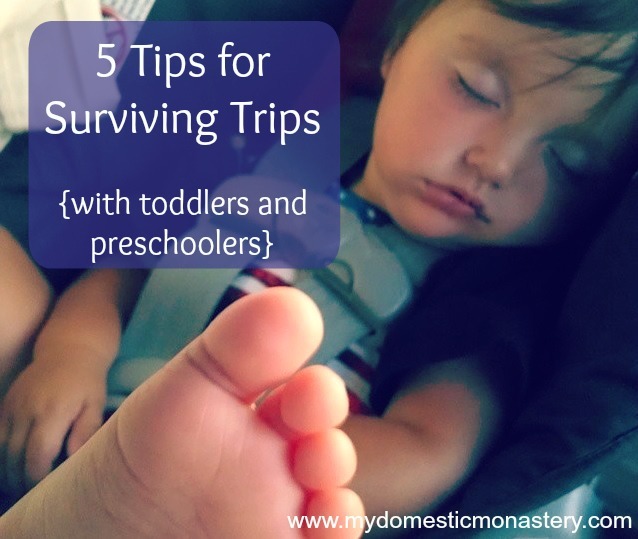 In this time of year, it seems like even normal families are on the road quite a bit, so I thought you'd appreciate my top five tips for surviving trips. Road trips are more manageable for me if I build in some treats for myself. I buy snacks for the girls (see next point) but I also buy a few little snacks for myself that I wouldn't normally splurge on. On really long drives, Andrew and I take turns driving (and sometimes I take the girls on trips by myself, and am obviously the only one driving, then) and I find that: travel sleep + staying awake while driving = a no-go. What keeps me awake is some good music, a good book on tape (that we can all enjoy), some caffeinated drinks to go, and maybe a good podcast or another one or another one or another one! And honestly, sometimes even just holding hands with my husband while he drives chirks me up a bit. Mouths that are chewing aren't yelling (or chatting)! For silence in the car, I bring a lot of snacks, and I stick mainly to snacks that are treats. You know what those foods are for your family, so I won't get into specifics. This also keeps everyone's tummies full and the crankiness down. I used to pack a box of toys for our long trips, but that got to be really messy, and didn't really entertain people all that well. It's hard to play with toys in a car seat! (At least the kind of toys my daughters play with - i.e. play kitchen stuff, dollhouse stuff, etc.) But, I find that books can provide endless entertainment, and I can afford a few ripped or thrown books since I buy our books used. This is especially entertaining to a toddler who likes to rip books and normally isn't allowed to. (For the record, they do actually look at the books, too, but it's nice to know that the books they're reading can survive a little rough and tumble if need be). I usually keep movies for my back pocket trick, because they work like a charm! We have several movies uploaded to our Kindle Fire (ours may actually be a 2nd generation, but same idea), and that keeps our older one pretty happy. (I think the younger will appreciate it more when she is forward facing.) Our favorites (because they're long and wholesome and not annoying to hear over and over again) are The Sound of Music, Annie (the 1999 version is our favorite, but I haven't seen the newest one yet), and Mary Poppins. What are your traveling tricks? Loved this post, as we're leaving for a trip tomorrow. I think plenty of snacks is a good distraction, and also having music that the kids like. We also make a point of building in time for one long stop at a fast food place with a playground. My 3 year old daughter gets carsick frequently, so I've had to figure out how to deal with this. First of all, if it's a long enough trip (more than an hour) and it includes off highway (windy, bumpy) roads, I do kid's Dramamine. This usually keeps it at bay, but not all the time. I also keep crackers on hand because I've found that low blood sugar leads to nausea with her. She's really sensitive to the sun being in her eyes and I remember from when I was a kid and got carsick that this would make things worse. Now we have a van with window shades, but before I'd hang a blanket on the window if it was really bad, and I got her sunglasses. I also keep a bucket right next to her seat and a change of clothes in the car at all times to be prepared for the inevitable. It's not fun (especially for her!) but if I'm prepared and I pay attention to her cues it's not as traumatic for all involved. Great tips! We travel some too since we are about 6 hours from my family (1 hour from my husband's family, so that's not too bad). And then our trip to the beach is about a 10 hour drive. One thing that worked well for us when we only had two kids and they were both in diapers (twins), was to fold down the bench seat in the back of our minivan and leave a space for diaper changes. It worked so much better than trying to do diaper changes on those too-small changing tables in fast food restrooms. And it was a lifesaver when I had to travel by myself. Now I have 3 and that trick no longer works; now we need that back bench for seating. For our ten hour beach trip, last year we did it in one day (we've often broken it into two in the past and stayed with friends) we planned an early departure. We got up at 3 am, got the last stuff in the car, got the kids in, and headed out. We were on the road by 4 AM. I am not a morning person and that was HARD, but so worth it. The kids all slept until we stopped for breakfast (about 3 hours in). We got to our destination before dinner and the kids were great! It was amazing. It worked so well that I considered leaving about that early for a trip to see my parents so that we could be at their house around lunch time. It ended up not happening, but we're definitely planning for the same thing in a couple months when we make that 10 hour trip again. Oh! One more thing. I've also listened to a Rosary CD in the car, especially on really, really long trips. I usually put it on around when it would be nap time at home since it is much more calming and the kids get a break from listening to Veggie Tales CDs or Toddler Songs.